This entry was posted in Mouth Wash, Oral Care, Oral medicine and pathology and tagged bad breath, biotene, dry mouth mouthwash, parched mouth, plaque, sore mouth, ulcers, Xerostomia, Xylitol, zinc gluconate on April 14, 2012 by chzechze. Chloraseptic is an American brand of oral analgesic produced by Prestige Brands Inc. Its active ingredient is phenol, a compound whose antiseptic properties were discovered by Sir Joseph. Other Chloraseptic formulas are based on benzocaine. Chloraseptic was invented and originally made by Robert Schattner it was later bought by Richardson Vick, which merged with Procter and Gamble in 1985. 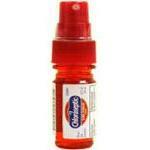 Chloraseptic can come in many forms for example a chloraseptic spray, chloraseptic mouthwash and chloraseptic lozenges. This entry was posted in Oral Care and tagged Chloraseptic, chloraseptic lozenges, chloraseptic mouthwash, chloraseptic spray, Chloraseptic Spray Directions, chloraseptic spray emergency, Chloraseptic spray side effects, Chloraseptic Spray uses, phenol, sore mouth on July 15, 2010 by samanthaloh.